« Fruit Salad – A Healthy Temptation! In Mexican Cuisine, flan is expertly crafted and comes in all kinds of varieties. Flan Napolitano is a sweet custard made from eggs, milk, cream cheese, and sugar, soaked in a delicious caramel sauce. 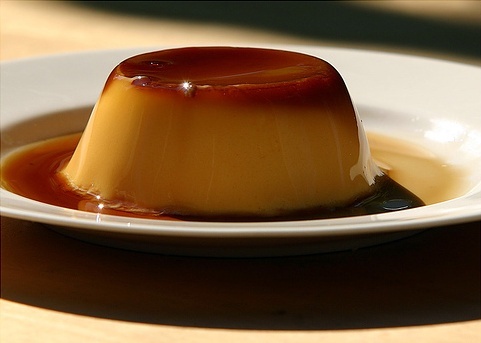 The word “flan” in Spanish rhymes with “dawn”, although many English speakers would say it rhymes with “man”. But no matter how you pronounce it, it’ll always delight your palate. Although there are many ways to prepare this Traditional Mexican Dessert, no doubt you’ll be enchanted by the following recipe. For the caramel: Combine 1 cup sugar with the 2 tablespoons of water in a saucepan and place over medium-high heat. When the sugar begins to melt, swirl the pan over the heat about 10 minutes, watching for it to darken to a honey-amber color. Remove from heat and immediately pour into a flan mold, tilting it so the caramel coats up the sides and the bottom evenly. Place the mold in a large roasting pan and set aside. Preheat the oven to 325 degrees Fahrenheit. Bring a kettle full of water to a boil and keep it hot. You’ll use this for a water bath. Thoroughly combine the condensed milk, evaporated milk, cream cheese, and vanilla in a saucepan and place over medium-low heat. Add the cinnamon stick. Bring to a simmer, stirring occasionally, but don’t allow it to come to a full boil. Remove from heat. Cream together the eggs, yolks, and remaining 1/2 cup sugar in a large bowl. Add a pinch of salt. Whisk vigorously until thick and pale yellow in color. Remove the cinnamon stick from the hot cream mixture. Gradually whisk the cream into the egg mixture, but be careful not to add it too quickly as the eggs will cook. Pour the custard into the caramel-coated flan mold. Carefully pour the hot water from the kettle into the roasting pan so that it’s about halfway up the mold’s side. Transfer to the middle rack of the oven. Bake for 30-40 minutes, though it may take longer depending on the oven. If you notice during this time that the surface is starting to turn golden-brown but it’s not fully cooked yet, cover it with foil so it doesn’t burn. You may also periodically insert a knife in the center of the flan to check it’s consistency. If the knife come out clean, it’s done. When the custard is just set and slightly jiggles, it’s time to take it out. Let it cool in the water bath. Refrigerate fo a minimum of 4 hours. To serve, run a knife around the inside of the mold to loosen the flan. Place a serving plate over the mold and invert it to pop the flan out. This entry is filed under Desserts. You can follow any responses to this entry through the RSS 2.0 feed. You can skip to the end and leave a response. Pinging is currently not allowed.